2:02 Awareness of benefits of yoga for everyone has led accessible yoga to become more mainstream. Work to make yoga more accessible has been going on for some time – extending yoga to different populations. 4:50 Yoga media is not reflecting reality. Yoga Journal did not fully commit to putting Jessamyn Stanley (a black, large-bodied yogi) on the cover as they had said they would. But when the most conservative yoga media moves in that direction, there is progress. 6:34 Progress but push back from corporate yoga. Specialized classes are not as profitable. Large yoga chains offer “gym” yoga. There are two different yogas “gym yoga” and everybody yoga. Accessible yoga is getting back to what yoga is. Yoga is 1000’s of years old and started for monastic males but has changed many times. Yoga is the west is more physical but it is changing as the spiritual aspects of yoga become more important. Also, the potential injuries of extreme physical yoga are becoming known as more high profile yogis are having hip replacements. 10:52 In the future, dichotomy will remain. Physical yoga needs a new name and will be subsumed into the gym culture .Accessible yoga teachers need to have skills to have a diverse, integrated, mixed level classes to address anyone who comes into the room. Many just want to participate in a yoga class. 12:20 Teaching skills to teaching levels of pose at same time. Most teach one level and then other level. Find language to teach both. Preparation can be different and then the cues for the pose are the same. Example: cobra pose explanation for mat and chair students. 16:13 Awareness growing of simple, subtle yoga. Body mechanics for safety. Yoga why do we do this practice; why do we do this pose – what are benefits and how do we make this benefit available for everyone. 17:50 Western yoga is maturing. Questions about what is yoga, how do we make it beneficial for everyone. 20:57 Large yoga brands will see this “accessible yoga” as marketing opportunity. May take away accessible yoga’s opportunity to own the message, not letting the brands to formulate the message. Clothing brands sell on aspirational model. Will start campaigns based on accessible yoga. Don’t let them co-opt the message. How do we maintain control of the message. It can feel like success to be included but what is lost. How well do these corporations support the community. 25:44 Accessible yoga is not as profitable; can’t be scaled up as easily. It may be a financial burden for students to pay for classes. Accessible yoga teachers can not make a living from teaching yoga classes. They are often asked to teach for free. Value in well trained teacher who should be paid and make a living. We need additional financial models. Yoga industry multi-million dollar industry. 99% of yoga teachers can’t make a living. That’s not acceptable. Teaching training and private classes are more profitable. Accessible classes need to be profitable to continue. Corporates need to support yoga teachers. Yoga Alliance is considering paying teachers directly to teach accessible courses. Recently added to their mission M making yoga accessible. 30:00 Making progress – lululemon could be the model. Yoga Service Council – supports accessible yoga organisations. 31:04 Accessible Yoga book by Jivana will be out in the fall. It is for students who think they can’t do yoga to shift awareness. 1:52 Interest in Thai Yoga – more authentic than yoga as it is currently taught. It is called Ruesri dat ton. The monks in Thailand practice this yoga. Uses the breath, great attention to detail, build pressure and then with poses let the pressure dissipate. 5:57 Michael teaches Thai yoga principles but not Thai yoga postures in his classes. Works with the breath, don’t push breath down to the belly but rather keep in thoracic area to stretch out the thoracic area which provides support to the pose. People of size often have large belles which push down and restrict the movement of the rib cage. 8:20 Modification for large-bodied people: Using forward bend as an example, forward bending is difficult because the belly is in the way and to get fingers to toes requires extensive stretching of the hamstrings. Bend the knees and may feel opening in the thoracic rib cage. Belly will push into diaphragm and back opens more. Belly used as a catalyst to open up rib cage. Child pose as an example, the purpose is to fold the joints and then let the weight of the body sink into the pose. Many (often men) have trouble with flattening the tops of the feet in child pose and need something (blanket, mat) under their ankles to get into the pose. Use Chair for the head. Play with the movement, come out when uncomfortable and then back into the pose. 14:15 Works with students in yoga classes and also as massage therapists. Has yoga teachers coming to him for help with injuries – wrists, lower back, neck and shoulders. Repetitive movement that goes unchecked can lead to injury. Self- practice is for self-exploration, self-relfection, paying attention to the body. 16:50 Is yoga more accessible now? When Michael started 20 years ago, there was little interest in teaching large-bodied students. Only 3 teachers in his area were teaching large bodied students (lives in NYC) Started his own studio because of the lack of opportunity. Now included in norms of yoga but there is a push back. Mainly a financial concern: large-bodied people need larger exercise clothing, larger mats, and more space to do yoga. So it is not of interest to corporate yoga companies. A grass roots approach is working now and it may not be taken over by big business. It is better as there is more creativity in the grass roots. 19:35 Big business yoga can be very dogmatic, very limited, too financially based, no room for ordinary people. Looking for a “famous” teacher can also be unhealthy. Classes/students look the same, no growth occurring. Teachers limited in the type of students they can teach. Yoga will survive, but growth in yoga teaching/practice is questionable in these circumstances. Teachers we looked up to 20 years ago are experiencing injuries because of the type of yoga and student they teach. Their students will have the same problems in 20 years. Individuals must have their own practice – take classes, read, work out what is best for their body in their own practice. Can get too engrossed in the movement without paying attention to how the body feels. 23:00 Why are students attracted to Buddha Body Classes? Students are quirky, funny, talkative curious and often have a lot of fear. Fear can be generated from previous classes where teachers did not know how to teach them and they feel shamed because of their body type. Michael has started streaming classes on Sat AM – the audience is growing and more and more are interested in these classes. Allows someone to do the class in their own space where they may be more comfortable. Because of Michael’s emphasis on safety, he breaks down the pose as much as he can, give variations, explain why they are doing the pose but emphasize they must pay attention to their own body. 4:50 Does a full time career and teaches many classes and retreats. Can do both because both serve her. Speaks her truth. Started with 2 yoga classes and now with the demand they have run out of space. A job is something steady, teaches you how to be a better leader when combined with yoga. Both of working and yoga serve her and complement each other. 7:24 Super busy days with working full time and then teaching classes also. You need to rest, to nourish yourself, demanding to constantly give to others, Your activities have to serve you. Uses classes to fulfil her. 12:00 Yoga teaches to do expect to do it all by yourself, don’t have to be hard, always right, and in your ego space. Yoga has changed her in beneficial ways. She is trying to make it accessible for all. 13:30 Students feel this creativity; team members feel they have learned to accept failure but to keep trying. Allowing yourself to fail. Thinking outside of the box; off of the mat. Step outside the boundaries, and be creative. 15:40 Kremena espouses yoga for everyone; would like to attract more men to her yoga classes, Ages range from 25-40 in Amsterdam. Taught children in Africa, very different teaching, different needs, different poses. Some people taking classs at work have also become yoga teaches. It took time to feel comfortable with the yoga and then to want to become a yoga teacher. Changed the workplace through yoga; more friendly environment in the office. Looking for a permanent space to be able to offer more classes given by different yoga teachers. 19:36 Mentoring – starting with young teachers asking for recommendations for resources. Starting out you need a guide. Goes to young teachers classes to monitor and help them. She is putting an online program together to new teachers. Contact through her website. 23:14 Retreat in Bali in February – Bali program for practioners. Has meditation, easy flow yoga, meals, nature activities, and yoga philosophy. All activities are optional. 27:55 Don’t have to change who you are to practice yoga. What is your intention when you do yoga practice. Find out what serves you, encourage self-development. 3:20 Mark came to embodiment yoga when he realised his life as a teenager was screwed up. With yoga and aikido, he realised there was a lot of beauty and richness in the movement and something in it for him. The next step how do I teach this to others. 4:25 Embodiment principles = life skills that can’t be learned from a book, i.e., leadership, yoga, stress management. Practical life skills: breathe, peripheral vision, relax your tummy are skills to bring down your stress levels. The yoga teacher models relaxation and this flows out to the class and they also relax. 7:04 Yoga off the Mat - YouTube videos of Mark teaching embodiment principles. Asking students to take up space and being seen – spreading the arms and legs out and making yourself big and then bringing the limbs in and ducking the head to be small. People will feel comfortable in one of the opposing poses and not in the other. What is the emotion attached to being uncomfortable, is this a pattern of living are questions to ask to build a practice for yourself off the mat. 12:00 Why and How does Yoga Change You? Practice gives you tools like persistence, dedication, etc. 14:02 What is the biggest change you have made because of yoga: he’s alive, sober, and in an intimate relationship. Need self-awareness, self-care, an self-regulation to be in a long-term, happy ,intimate relationship. 17:29 What as yoga practitioners can we learn from other movement modalities? First acknowledge that yoga is very dense and could be a life-long study. Why are students choosing this type of movement; is it a good or bad pattern for them? 19:38 Students come to Mark to explore themselves through movement. Each teacher has to decide what their aims are and fashion the practice to meet the aims. Using whatever movement modality is best. Mark has developed a system for confronting and exploring oneself and how to change the things the student wants to change. As an example, Mark may do svasana in the middle of a workshop since the purpose of the pose is to explore what the student is dead to in their life or as a hard-core death meditation. It is inappropriate for the end of the class. 23:10 Modern yoga has evolved into the guru, hippy, Gordon Gecko model. Each has its positive sides: guru has tradition, Gordon Gecko is based on evidence-based, logic, exploration and the hippy questions hierarchy, lack of equality, acknowledging feeling in the somatic body. They each have a negative side. 27:13 Yoga in the 21st Century – yoga for everyone and flexibility of approach. Embodied Conference in mid-November 2018. Free, online with a wide variety of speakers. 5:05 Tips to stay healthy while grieving. Sleep, digesting, hydrating may all be difficult. Yoga is one of the activities that can be accessed early. Doesn’t require talking about our emotions and brings us back into the body. Can help with sleeping, digesting and hydrating. People are dealing with the ongoing connection they feel with the person who died. The relationship continues. 7:50 Myth has been that you “get over” grief by detaching from the person who died. Research shows that maintaining a continuing bond helps with living your life. 8:20 What to do for the teacher and other class members when a long-time member of a yoga class dies. Understanding that the class needs to be modified, slow the pace, each person encouraged to share their feelings, perhaps a letter to the person or write down feelings. Open ended yoga questions: what does grief feel like in your body. Create a yoga pose to reflect those feelings What would a statue look like that represents the person who died. Have your boecaedy look like that pose. Allow people to speak freely about their grief. Disenfranchised grief – not allowed to speak freely because of a perceived social position. For instance, a friend’s grief is not as valued as a family member’s grief. 18:09 Heather has written a book called: Mindfulness and Grief. She had started Yoga and Grief previously, an 8 week program for people grieving. She was also exploring meditation in more depth. She interviewed past participants of the yoga and grief classes to see what the long term result of the classes were. The book is in an 8 week format, but can be done in the time period that an individual needs. There are a variety of tools to address the physical symptoms of – anxiety, tension – and tools to use for their life after loss. Chapters are: Mindful Awareness, Conscious Relaxation, Compassion/Forgiveness, Vulnerability and Courage, Unstuck, Reconstruction and Transformation. Each week/chapter has tools for that week including journaling, creative projects, yoga. Grief permanently changes you in many ways and the change may even be positive. Yoga consists of ancient techniques to tend to our suffering. 2:12 Introduction to Yael Sunshine and integrating dharma into class for those diagnosed with breast cancer. 2:58 Definition of Dharma: Following your inner guidance and connecting with universal principles. 4:35 What’s happening in their life because of the diagnosis – dealing with fear, choices are difficult because may be pressure from medical community and/or family. Give them more tools. Build a relationship between the concepts, ideas, to being felt in the body. 7:05 Difficult to go against medical advice, some can follow their own body’s cues, others may trust their doctor for the treatment. 8:55 Weave some specifics into the class: Ahimsa – violent self-talk, notice the quality of their thoughts, are they judging themselves, not listening to the body, violence against the body. Class pause reminded to come back to their thoughts and observe. Feeling betrayal of the body, anger at the cancer, do I do what the body needs. Observing Pratyhara, not being swayed by the sensory inputs, but listening closely to self and body without distractions. It is often a roller coaster ride and difficult to find and maintain equanimity. May just need to accept the emotions generated by the cancer journey. Using other somatic movements are helpful. Did a runway show where they were to walk down a “pretend” runway and say to themselves I am beautiful. In another instance, Yael gave them permission to say “Get your hands off me” This journey has a lot of people touching you without permission – medical personnel etc. and the cancer patients have little choice. Was a deeply felt emotion to take back control of the body. Can I inhabit and experience what I am feeling. Need space to express negative feelings; feelings that are socially unacceptable. 16:15 In each class, the students’ health is varied from just diagnosed, to being in treatment, to being in remission, etc. Class must be modified to match the energy of the students in the room. Although dharma and the goals of the class may not change, the asanas, breathing and meditation may be modified to reflect where the students are and what they need. 18:15 Teaching is dependent on intuition Cultivate being able to sense the energy in the room. Question the students on how they are feeling and what they want from the class and always have some ideas of what you can do given the situation of the class on that day. What is the final pose? How do we work up to it? What’s the emotion of that pose that people can feel? Need preplanning, experience, intuition. This is a learning experience for a new teacher and can only be obtained by teaching. Experienced teachers may rely too much on their experience, but planning what they want to achieve this month and what is the precept they want to offer and how to do that is also important? 24:21 Yael is an educator, so uses curriculum mapping and uses this tool to address planning for her yoga classes. What is the nature of the students, each class especially one that has a stable membership, has its own character. Different issues arise for different ages, conditions. Sometimes resistance is warranted, sometimes not. Using the 5 koshas to figure out a way to practice and organise the class. What is the most pressing issue? Your Shift Matters: Breakdown to Breakthrough – book by Dana Zarcone. Yael has contributed a chapter. 2:15 Adjustments – many of us were taught hands-on adjustments to make the student’s body take a certain shape. Christine prefers supporting the student to go into their own body and learn to make their own adjustment and correct their own movement. Her philosophy is to a) help the meet their own yoga goals and b) how to support them to realise what they need to do make their own adjustments. Christine uses the Hakomi (a body-based therapy) precepts of mindfulness, non-violence and organicity to direct her adjustments. 8:15 Walking toward experiment. Two individuals each go into mindfulness, one quite deeply. The other one walks toward the other one. When in mindfulness, one is highly sensitized to movement and proximity. Students in a yoga class are usually relaxed and will be in some form of mindfulness and so very aware of movement and proximity. 16:25 Student led yoga – teacher supports them in meeting the student’s yoga goals and not the teacher’s goals. Teacher needs to be aware that cues will be interpreted differently by different students. Teachers need to learn how to track their students to see if a cue is causing them to react negatively. 21:00 Adjustments for safety. When is it appropriate to touch a student? Need consent, trust, and a sense of safety before adjusting. What is your reason for and how to touch a student to make an adjustment. May touch to show a student a part of their body that they are not aware of or to emphasize a movement that is dysfunctional. But a light touch or tap is sufficient. 27:00 Bigger adjustments may be needed if the movement disrupts the student’s ability to understand where their body is and how it moves (i.e., arms overhead and how to externally and internally rotate the arms). If the teacher puts the student in the pose, then they haven’t learned anything. 29:00 May not be able to do the movement because they don’t have the neural pathways to do so. Students may not be aware of habitual movements and don’t know where there body is in those movements. 35:07 2nd toe lift: after warming up the toes, lift only the 2nd toe. Because most of us have worn shoes all of our life, we don’t have the neural pathways to move our toes individually. Doing the 2nd toe lift builds neural pathways (can help by having a finger lift up the toe) and then have to work on “training” to build strength to lift the toe without the finger. 35:45 Fine tuning our tactile touch. Just touching and gently moving the student to the extent that the student does not resist. Don’t push to the resistance and beyond – this is where injury can happen. 2:40 Writing and Yoga - Kilian found that yoga and writing complemented each other and were therapeutic in her experience. 4:40 Benefits of yoga and writing for students – a) helps them get through their blocks, b) uses chakras as part of the course, c) students begin to understand that creativity is not a luxury, d) yoga has the body releases the blocks that prevent creativity, d) use meditation and breathing as bridges between everyday life and the yoga space. Yoga puts them in the present. 11:42 Developed an online course to be launched June 2018 consisting of: gentle yoga, mindfulness, breath, meditation. Movement to get to know the body, each week work on a chakra, meeting students where they are at, and teaching them to find out where they are at, then restorative yoga. Teacher is just the guide, your body tells you what you need to know. 15:25 Class starts with an intention, mantra and meditation on arrival. Use journal prompts about how body feels, and what are blocks. Encouraged to really notice what is happening when student moved, breathed, meditated. Courtney started this after a severe car accident with a head injury. Her former preferred yoga – power yoga – was no longer accessible and she had cognitive issues. Going back to the basics in both yoga and writing helped her have a conversation with her body and helped her recovery. 20:00 Migraines started after the injury which would incapacitate her. Started an online course for migraine sufferers which includes education to find your triggers for a migraine, and to dampen the symptoms from getting worse. Exercise can trigger migraines so have to have very gentle movements, have a conversation with the body to see how that felt, learning what is acceptable. Poor posture and hormonal imbalances can also trigger migraines. Yoga can help with these also. 24:35 Yoga is such a beautiful practice; if you can breathe, you can do yoga. 3:56 Created a class for people in treatment for cancer, long term survivorship, and in transition. She was diagnosed with cancer and could find no suitable yoga classes as she went through the stages of cancer treatment. Students are all laying down for the entire class. Yoga allows people to deal with the emotional aspects of the diagnosis or living with a chronic disease. Allows them to decompress. 60% of people diagnosed with cancer will have a re-occurrence. They become chronic patients then and need to manage their nervous system as they go through the process. Yoga provides equanimity as it has the most tools to help and makes the most impact. The ripples of the diagnosis last for a long time, often resulting a many stress-related issues. There is nothing that yoga can’t make a little better. 13:00 Benefits for students – class concentrates on breathing fully and naturally. People in stress often have constricted breathing. Makes space for people that are in some form of healing, it provides community, and cancer often motivates people to have a healthier lifestyle of which yoga is one aspect. 21:50 Witness – a non-judgemental look at ourselves, accepting our bodies as they are now, notice what is happening without attaching emotions. Jean gives a one minute witnessing meditation that she often uses in class. 22:30 Class begins with students that want to introducing themselves and what their bodies need. Language is very invitational asking people to move in any way that their body can do easily. Class usually consists of 25 minutes of stretching, 25 minutes of meditation, and 15 minutes of breathing. Medical doctors are more accepting of yoga as part of the treatment for healing from cancer but do want valid research about yoga in this role. Research in yoga is changing from surviving cancer to the quality of life in the journey. Recent research which is more valid than older research shows that yoga is the safest and best for the majority of students in a class for people with cancer or surviving. 40:45 Transition – Jean brings the classes breathing and meditation aspects to the student’s home that can no longer attend class. Yoga allows space for discussing what is eternal in us; what transforms but does not die. Yoga helps us “walk each other home”. Helps other students in the class accept the death of a former student. 43:45 Yoga for Healing Phone Call – once a month Jean posts the date on FB for the monthly phone call which is very similar to the class. 48:40 Jean has uploaded 52 meditations on her website (www.yogabeing.net). This is her legacy to produce content that will be of use to others with chronic diseases or those that enjoy the meditations. 1:40 Yoga Research Protocols - Lara developed protocols for departments at Sloan Kettering. She also was a subject of research projects when she was at university. She also dropped out of one which gives her insight into the issue of keeping subjects continuing with the research study. Can give incentives, but incentives have to be acceptable to a wide variety of subjects for the research results to be applicable to the whole population that is being studied. Developing protocols is a collaborative effort which has positive and negative aspects. 1st step is literature review to look at what yoga research and other movement research has studied on the research question. 13:120 Medically trained and Ph.D.'s are becoming much more accepting of good quality yoga research and yoga in general but they need the expertise of experienced yoga teachers to add to the protocols developed. Lara is constantly applying the concepts learned from research to her teaching and research. 17:00 Yoga teachers generally have low interest in yoga research. Lara is contemplating a Facebook group like a book group to read and discuss yoga research. Wants to share her expertise to other yoga teachers. She speaks up about misuses of research (e.g., yoga (mats) cause plantar warts which led to cleaning yoga mats after every use) but this was based on 5 instances of yoga students having plantar warts among a podiatrist' s clientele. However the cause of the warts was not definitively yoga - could have been many things. 26:00 Yoga teachers also need to be more collaborative because if they don't they have to be a expert at everything. Teaching basic yoga may not need as much collaboration but when teaching students with health issues it becomes very important. 1:26 Lara Benusis Introduction - Has been teaching yoga since 1996. Was recruited by Sloan Kettering Memorial Cancer center as a yoga teacher and researcher. 6:15 Takes years to understand research and design of research. Quantitative research is data driven - reduces to numbers. Qualitative research is telling the story. Yoga teachers are qualitative researchers as they note what is happening with the body, during movement, breath and meditation. 9:21 Yoga research vs. generic research. Questions about yoga can sometimes be answered with other kinds of movement or rehabilitation research(e.g., exercise oncology). Research is reductive; can only at this time measure or describe the components (movement, breathing, meditation) of yoga, not the whole yoga experience. First step in research is literature review to see what has already been done in yoga and other complementary areas asking similar questions. Don't want to replicate completed research. 16:36 Differences between the Western and Eastern approach to yoga research. Data driven vs. experiential. Karen Sherman was the first significant (Western) researcher to research yoga's benefits. Her study was about back pain and compared yoga intervention to standard treatment at the time. Put yoga on the evidence-based map. Research pushes the conversation forward, but can't answer all of the questions. Parts of yoga will be missed because of the reductive nature of research. But different research projects can help shine a light on different aspects of yoga. 3:36 In 2002, yoga culture changed. Big corporations bought yoga studios, the phenomenon of "yoga celebrities" began, advertising changed. Yoga advertising started following the lead of fitness, beauty and fashion industries. There was money to be made. 7:55 Few talking about this cultural change. The discussion of how to present another face of yoga has grown exponentially since 2010. But yoga is still being commercialised. 9:53 To change a culture, storytelling is powerful. Although what you hear is not in your experience, it can generate empathy and a willingess to be part of the discussion. It emphasises the "humanity" of people and makes it easier to see points of connection. 12:31 How do we bring the corporations into the discussion? There has been some success discussing these issues with the yoga magazines. But there are constraints on corporations in how they can react to these points. Convincing them that there is still a profit in not replicating the existing models (fitness, beauty, fashion) First step is to have discussions between the grass roots trying and corporations. 17:00 Yoga and Body Image Coalition gave visibility to many people working on their own to expand the perception of yoga. It was created 4 years ago to aggregate these individual efforts to increase reach. 26:10 New Book: Yoga Rising: Stories of Yoga Renegades. The conversation was not complete after the 1st book was published. the 1st book - Yoga and Body Image - told the stories of the benefits accruing to individuals using yoga to gain body acceptance. Book II: Yoga Rising is critiques of business and cultural models in yoga or who do you become when you reach body acceptance. Book III: will have the theme of yoga's effects on trauma and grief. How yoga helps with the adversities in our lives. 29:55 Advice for Yoga Today? Really step deeply inside their practice to see if their life reflects their yoga practice. How have you taken your yoga off the mat? (and you can access free downloads to guide discussions about these issues in your community for both books. 2:15 Michael explains why he has more faith in yoga than ever before. Mental health workers and therapists are now taking yoga therapy training as they see the benefits. Neuroscience research is now supporting the body/mind connection. Research on consciousness. Helping people come into the present and become aware of their own insights. 8:30 In the 1980's there was a great flourishing of yoga therapy (Dean Ornish's study on reversing heart disease with lifestyle changes including yoga, Michael Lee began Phoenix Rising Yoga Therapy and the International Association of Yoga Therapists began in 1989.) Michael explains his own deep experience with yoga that led to some important insights that he carried with him since he was a child. Michael and other well-known yogis knew that yoga could help even if they didn't know why. 17:05 About 10 years ago, neuroscience and psychological research started explaining why yoga can help people change. The connection of neuroscience, psychology, yoga philosophy, and Buddhism/mindfulness began to explain what everyone was experiencing. 18:42 The changes in Phoenix Rising Yoga Therapy training over the years. Started as very experiential and has gradually added knowledge components as the research start's clarifying the results of the experiential learning. 21:16 Michael recently talked to astronauts about the overview effect. As astronauts contemplate the earth when they are in space, they begin to change. They understand that there is one small blue marble that all of us live on and they become much more interested in environmental causes, or philanthropy because they understand the world's fragility. 25:38 What is the future of yoga? Yoga therapy is becoming much more accepted in the medical realm as it becomes a modality for helping cancer surgical patients recover and to help with the changes needed in patients and their caregivers. Huge increase in interest in yoga therapy in Japan. 30:00 Difference between yoga and yoga therapy. In essence there is little difference but in practice yoga therapy requires deeper knowledge and the skills are quite different. 2:30 Mindfullness vs meditation. Is there a difference or does it matter. 6:30 Increase in anxiety - our technology is a key contributor to the increase in anxiety. The devices are intentionally addictive and our brain produces dopamine at every ding to ensure that we will continue to use the device. 12:00 Using hypnosis in treating anxiety. All of us have reached a hypnotic state which is a focused state of awareness. Driving somewhere and then not remembering how you got there is called highway hypnosis - the subconscious took over while the conscious thought of something else. You change your focus by focusing on the positive which needs consistent practice but it can lessen anxiety. Yoga helps with this by emphasising focusing strongly on one thing. 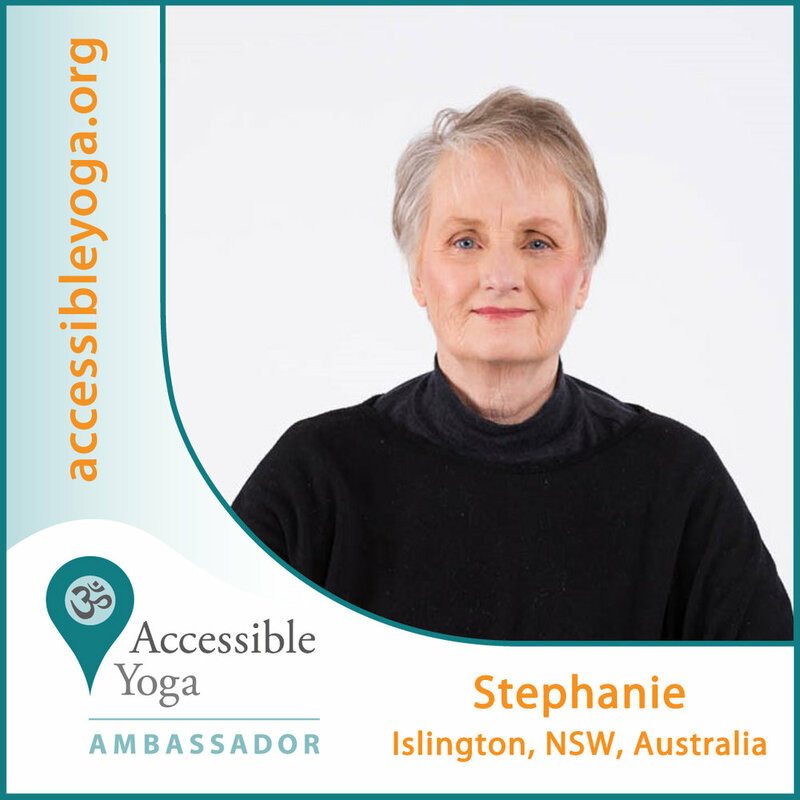 17:25 Stephanie works with women with anxiety primarily. She has developed a variety of techniques to help so each person has something that will calm them. It is partnership between the two of Stephanie and her client. 20:30 Short term vs long term anxiety. Although there are differences, there are more similarities. Using the techniques to calm the nervous system will work in either situation. Have to build the capacity for resilience daily with simple techniques. Two simple techniques are discussed and why they work. 26:43 Stephanie will have a book published soon: "Goodbye Anxiety - Hello Freedom: Building resilience to overcome anxiety"All of the many techniques that Stephanie uses are explained in the book so that anyone can find something that will be beneficial for them. To find out about the launch of the book: go to 5easywaystocalmanxiety.com to download tips on helping with anxiety and when the book launches, you will receive notification of how to access the book. 2:53 Tools used in senior yoga classes: sensory processing and integration techniques. Helps clear and reset the nervous system. 6:00 Teaching veterans: a former marine's view. Many ex-military suffer similar symptoms-PTSD, anxiety, pain, and "over-doing" Military trains nervous system not to pay attention to signals from the body and it becomes agitated and then needs training to learn how to be calm. 9:23 Yoga's benefits for veterans exercises to learn to exist in the parasympathetic state. Direct own energy and tone nervous system. 2:44 Positive Neuroplasticity -shape your brain throughout your life. Brain tends toward negative -survival mechanism. Brings out negative emotions and fight, flight or freeze reactions. Tools to bring about concentrating on the positive to deepen or grow neural pathways that pay attention to positive. Leads to resiliency. Gratitude practice. 24:50 Positive brain pathways plus experiential learning. Culture separates mind, body spirit. Priority to guiding people to connect with their body and feel safe. Breathing with Sharon Harvey Alexander 2:50 Sharon "loses" her breath at 15 and begins to find it again in her late twenties when she begins yoga. The connection of breath and movement unites all of the pieces of an individual. 5:54: Breathing, autonomic nervous system, vagus nerve definitions and connections. 11:00 Yoga Nidra - centering activity in the class. Relax and integrate the movement and breath of the rest of the class. 14:00 Types of breathing, what they do,and how they connect with the vagus nerve, nervous system and the brain. 16:50 Vagus Nerve can bring about relaxation through the right kind of breath. Fight, Flight, Freeze or rest and relax determined by either sympathetic or parasympathetic nervous system. 22:30 Learning to Breathe, Learning to Live by Sharon Harvey Alexander. Simple tools to relieve stress and invigorate your life. 6 Breathing techniques to stimulate the relaxation response. Includes guided meditation. A 5 week plan to implement stress reduction activities. 25:55 Koshas - ancient model to consider all of the aspects of who we are. Sharon's Book: Learning to Live, Learning to Breathe, Balboa.press.com and type Sharon's name or the name of the book to find it on the publisher's website.